It started with 15 seconds of silence and ended with an apology. It was the type of postgame press conference the North Carolina women's basketball team is tired of holding: explaining away a blown lead, a dreadful shooting night and another ACC loss, the third in six tries this season. Head coach Sylvia Hatchell — flanked by senior Jamie Cherry and freshman Janelle Bailey — stared quietly at a box score that didn't hold the answers. They didn't want to be there. 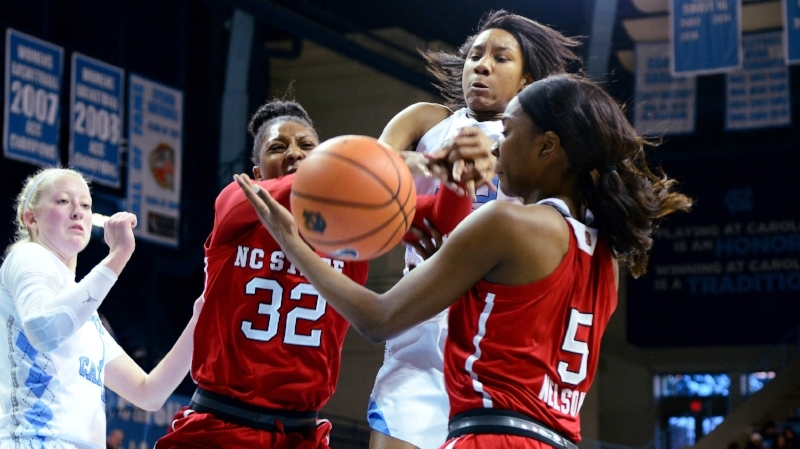 This loss, a 66-53 defeat to N.C. State, deviated a bit from the familiar script. The Tar Heels (13-6, 3-3 ACC) battled the Wolfpack (15-5, 4-3 ACC) for almost three quarters on Thursday, trading runs and big shots in front of an impressive crowd at Carmichael Arena. With 3:32 left in the third quarter, UNC held a 42-38 lead over the visitors. But the inevitable collapse loomed: two missed shots, three turnovers and four fouls by the Tar Heels powered a 14-2 N.C. State run and squelched any hopes of repeating last season's home win over their oldest rival. "We make mistakes sometimes that I bite my tongue and shake my head and tell the coaches, 'Put that on the film tomorrow,'" Hatchell said. The Wolfpack bled the clock in the final quarter, while a listless UNC team missed shot after shot. And when the final buzzer sounded, only five players — Leah Church, Taylor Koenen, Jaelynn Murray, Olivia Smith and Emily Sullivan — stayed out for the band's rendition of the alma mater. The rest of the players had had enough. This team has, at times, looked like it's had enough of this season. Through six ACC games, the Tar Heels have led in every one, sometimes by sizable margins. But at the first sign of adversity, they've fallen into the same losing habits that plagued them in the past two seasons. In its ACC opener, UNC led then-No. 13 Florida State late in the first quarter. A barrage of Seminole three-pointers spelled a 38-point defeat, the Tar Heels' worst ACC loss since Jan. 27, 2000. Five days later, at Boston College, the Tar Heels led by nine before one big run by the Eagles spiraled into a 13-point loss. Even in wins, North Carolina has failed to put teams away. Last week against Clemson, UNC held an 18-point that nearly evaporated in the final minutes, prompting a disgruntled Hatchell to berate her "average" team. Three days later, the Tar Heels held a seven-point cushion with three minutes left before Wake Forest took them to overtime. Their lone comeback, a one-point win against Pittsburgh, saw UNC with a halftime lead only to trail by eight in the fourth quarter. Hatchell has criticized the team's leadership in recent weeks, and she might as well have on Thursday. The Tar Heels shot out to an early lead behind two Cherry triples, only to fall apart as the quarter continued. They adjusted after halftime, breaking down N.C. State's hedging defense and feeding their primary scorers. But it couldn't last. With this team, it never does. After N.C. State's run in the third quarter, the Tar Heels trailed by eight points entering the fourth quarter. They scored just nine points on 11 attempts, relying on poor shot selection and turning it over in the process. Cherry said the team's offensive ineptitude came from poor ball movement. Hatchell said her younger players were forcing bad shots, which had little chance of success against an aggressive Wolfpack scheme. "We had a horrendous shooting night," Hatchell said, "but I think State's defense probably had something to do with that." It won't get any easier on Sunday, when UNC hosts Duke for the first time since last year's 24-point loss. Cherry said the Blue Devils' zone will be easier to attack — but zone defenses punish complacency, something the Tar Heels have shown plenty of in recent weeks. The team spent a half hour in the locker room after Thursday's loss, but there was nothing Hatchell could say to reverse its fortune. Paris Kea led the team with 16 points, but it took her 20 shots to do so. Bailey had 12 rebounds, but she nearly fouled out again and bemoaned the officials in the process. Despite grabbing 12 fewer rebounds and committing one less turnover, the Tar Heels took four more shots than N.C. State. They couldn't convert: 32.8 percent from the field, 27.8 percent from deep. Only Leah Church, who made her only attempt, shot better than 50 percent. "They're much more athletic than we are," Hatchell said. "We didn't have anybody that could beat them one on one, at all." It's a systemic problem with this group, one that the box score doesn't have the answers for. The talent is there, this year more than ever: Bailey is a frontrunner for ACC Rookie of the Year, Kea is a preseason All-ACC member and Cherry is as clutch as they come in the conference. Even without injured guards Stephanie Watts and Destinee Walker, it's a team that can threaten anyone in the ACC. But when adversity strikes, the Tar Heels freeze. And when Thursday's game was over, alma mater filling the arena, they didn't want to be there. "I'll take care of that tomorrow," Hatchell said. "It's not okay. I apologize." Hopefully, for the players' sake, the apologies will be over soon.